For the last two or three months, the U.S. Senate has been going through the confirmation process for a new Supreme Court justice, and this has been like no other in the history of our nation. As difficult as it has been for many people, it may be an example of where Faith of the Pure Rays students have been in the planning process. Can we use this historical event, without judgment, as an archetypical story because so many people are watching it unfold? Can we apply what we have learned to our own plan to create our life? Over his lifetime, Judge Kavanaugh established a solid reputation in the judiciary and that allowed him to be nominated for the Supreme Court. He went to a prestigious prep school and Yale College. He was on the fast track to success. It was as if he walked forward on his path, and had finally reached the point where there was a door in front of him-- when he was nominated by President Trump-- and on the other side of the door was his ideal life. He reached out, but when he opened it, there, on the other side, was not his dream life, but a Brick Wall. He should have had an easy confirmation process, but instead he was accused of sexual misconduct. If he equates becoming a U.S. Supreme Court justice with his life, and he is not confirmed, this is the point where he could enter into his end of life crisis. Even if he is confirmed this weekend, he will go into American history books with a stain on his name. The accusations of sexual misconduct have backed into the corner with two untenable options. If he is guilty of the accusations, he cannot lie to Congress--he will face perjury charges-- and he cannot tell the truth. Either way, he has to address the security principles of the Hinduism segment. On the other side of the circle, the parallel involves creating a plan that benefits everyone and then bringing in the people to help you. Faith of the Pure Ray students know that when you create a plan, there is resistance. After the allegations were brought forward, he and his wife sat for an interview for Fox News. He talked about his plan to clear his name. She is the person he believes he needs to help him get his life. Together, he brought in the support he needs from Fox News and their audience of Conservatives. Then he was able to defend himself from the allegations in last Thursday's hearing before the Senate Judicial Committee. He has the support of the Republicans of the Senate Judiciary Committee, and they voted to send it to the floor of the Senate for the final vote by all 100 Senators, who address the Crisis in the Family segment/ equality segment. They are facing resistance from their constituents for voting for a nominee who can sway the Supreme Court to the Right, and further erode the Liberties and Freedoms for all Americans. The Republicans have the majority in the Senate. They have the constitutional rights to confirm Judge Kavanaugh as the next Supreme Court justice, but the midterm elections are within five weeks, and the Democrats are building momentum for taking back the House and possibly the Senate. If they can take one or both Houses back, they will try to open an investigation into whether Kavanaugh committed perjury during his hearings, and President Trump may consider him to be a liability to his own plans before the final vote. 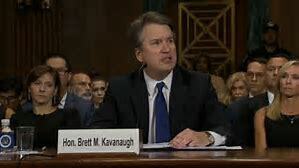 Judge Kavanaugh is not yet at the point where he can clear his name and then demonstrate his capacity to be a good judge. What does this teach us? Your plan cannot be based on weaving an illusion or on power games. If Kavanaugh is guilty of the allegations, he could have withdrawn his nomination "for the good of the country," and it would have been a positive first step to clear his name. If your plan doesn't address the root cause of the problem--which is ending the power games--it makes the crisis worse.